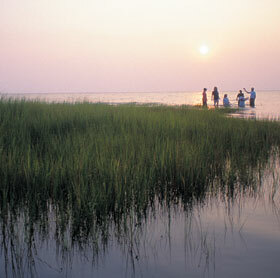 Though best known as a watermens' community, Smith Island is also a paddler's paradise for day or overnight trips. The meandering creeks, or "guts" through the island's 8,000 acres of marsh provide extensive paddling opportunities close to three island villages where paddlers can feast on fresh crab cakes and the island's trademark nine layer cake. As the hub of the country's soft shell crab industry, the island, from May through September, is bustling with crab boats, crab picking and tending to the soft shell crustaceans in the crabber's shanties. The shallow waters surrounding Smith Island are also a fishing haven for herons, egrets, ibis, osprey and pelicans. Paddlers frequently see them diving and stalking, their elegant silhouettes reflected in the water. Early morning or evening paddles are ideal for catching rockfish, experiencing the extensive bird life, or watching the light change on the water. Located 9 miles off of Crisfield, MD in the heart of the Chesapeake Bay, Smith Island's marshy archipelago has preserved an extraordinary natural environment and island culture. Once home to 800 residents, Smith Island now has 240 year round residents, spread among the villages of Ewell, Rhodes Point and Tylerton. In Tylerton, separated by water from the other villages, visitors can watch the day's catch being picked at the Smith Island Crab Co-op and purchase fresh crabmeat to bring home. The Smith Island Heritage Center in Ewell is well worth a stop to learn about the crabbing industry, the island's culture and Smith Islanders' unique dialect. Golf carts, bicycles and walking are the way to travel on Smith Island, when one is not in a boat.